Campione is a small Italian enclave of�1.7 square�kilometres with about 3.000 inhabitants, including about 1.000 foreigners, situated within the southern Swiss canton of Ticino (click here to see the map). Separating Campione from its motherland are approximately 18 km (11 miles) going south to the Swiss/Italian border town of Chiasso and approximately 14 km (9 miles) going west to the Swiss/Italian border town of Oria. Until his death in 777 AD, Campione was the private land of Totone Campione. The land was left to the Archbishop of the Milan Archdiocese. For hundreds of years Campione was known primarily for its excellent mason workers and other artists of the time. In 1512, under Pope Julius II, the Swiss were granted the right to annex the canton Ticino, but the Archbishop of Milan successfully demanded the property rights to Campione. About 200 years later, Campione was declared a possession of the Cisalpine republic, and then briefly became Austrian property. After the fall of Napoleon, at the 1815 Congress of Vienna, the Swiss tried to claim Campione as their own. They failed, and Campione remained part of the "Kingdom of Lombardy" (Northern Italy) until 1861 when it was awarded to the Kingdom of Italy. It has remained Italian soil ever since. Due to its strange position, Campione is Swiss from certain points of view and Italian from others: official currency is the�Swiss Franc, but Italian taxes are paid (even if foreigners resident in Campione�do not pay the full Italian income�tax, but only a fraction and this makes Campione a de facto tax haven well known in Europe), residence permits are issued by Italian authorities, but access to�the territory�of Campione is governed by Swiss visa regulations (there isn't any frontier between Switzerland and Campione), its residents receive Swiss telephone service and Swiss mailing addresses served by the Swiss postal service, but electrical power is brought directly from Italy and there isn't the required Swiss military service... in short, it boasts the typically Swiss qualities of cleanliness, efficiency and excellence as well as the well known Italian qualities of liveliness. 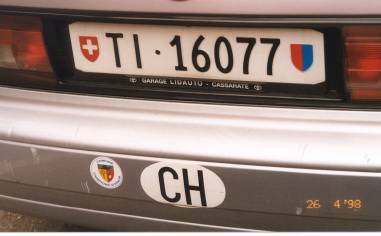 But let's talk about license plates: though it belongs to the province of Como (CO), in Campione Swiss auto license tags are used, as you can see in the picture, with a Swiss oval (CH), as for normal Swiss vehicles of canton Ticino. 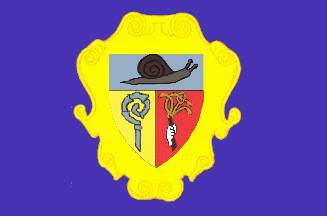 You can also see a sticker with the coat of the arms of Campione (click here to enlarge it), attached to most cars of the town. Most of the informations about Campione are taken from the web site http://www.lugano-properties.com/campione.htm and I must thank Olav Arne Brekke so much for the nice picture he sent me.